Many years ago, I applied to work at a local, independent bookstore with a decidedly spiritual/New Age bent. As it turned out, it was more of a yoga workout. I was hired and immediately assigned to the outdoor portion of the store, specializing in plants and fountains. Sounds lovely, right? And it is, very lovely indeed... Unless YOU are the person responsible for keeping hundreds of plants alive and many dozens of fountains flowing freely. For the next year, I watered and fretted and pruned and had dirt lodged beneath my nails. I grew big, weary biceps from hauling 10-gallon pots into and out of the fickle sunlight, dragged kinked, serpent-­like hoses behind me like headstrong pets, and scrubbed determined, fast-­growing slime from large cement basins. And rarely touched a book. On the other hand, everybody I knew who had a birthday, celebration, heartbreak, or Groundhog Day party that year received bookstore goodies, thanks to my terrifically tempting 30% employee discount. And plenty of interesting items made their way home to me, too. Nag Champa incense billowed as I practiced newfound crystal lore and placed bits of quartz in pouches, on altars, and over various chakras. I moved my things around my tiny apartment to accommodate Feng Shui principles, dabbed Goddess oil on my wrists, and cultivated my Theta brainwaves with rain-song CDs. 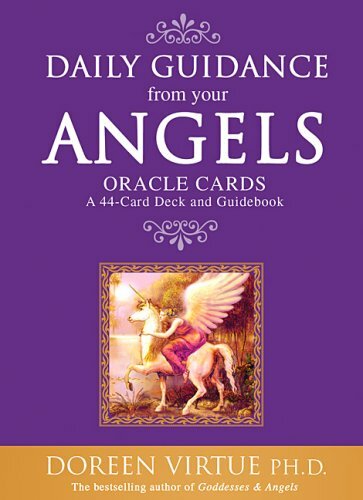 But the most enduring of acquisitions from that year was a pretty purple deck of cards called Daily Guidance from Your Angels, Oracle cards by Doreen Virtue. Not dissimilar to a regular deck of playing cards, these cards can be used in many ways, my favorite being: 1) Hold a question, problem, or request for insight in your mind, pick a card blindly/by intuition, and apply the words on the card to your question; or 2) Don't even bother with a specific question, just pick a card at random and see what it has to tell you. While my days at the bookstore have long since passed, the helpfulness of these cards has not. It's surprising how often I have I received a little piece of wisdom, a perfectly fitting recommendation, or a salve for a sorrow from this little deck! Like when I drew the card "Child" right before a visit with my birthdaughter, or the cards "Joy" and "Teacher" right after completing my Laughter Yoga Certification, or the card "Wedding" when I asked for guidance about my new relationship with Kevin (we're getting married on April 19th, by the way)! But over the years, I have pulled two cards far more frequently than any others: LISTEN and DAYDREAM. They have appeared and reappeared with their simple, insistent requests -- and each time I have smiled knowingly, nodded graciously, and then gone about my manic business as usual. I wonder if the "angels" just keep saying the same things to us until we hear them? Because earlier this month I took those two cards and placed them in my writing room window, scheduled half an hour to LISTEN and DAYDREAM (aka sit and stare), and then...did it. And it was GOOD! In fact, I've done so every other day for the last several weeks and have reaped a pile of riches for doing exactly nothing. I've noticed that ideas bubble up more fluidly during the daytime, and my normally hectic nighttime dreams shift to creative imaginings. I awaken to plays, musicals, poetry, and other interesting dreams that I actually remember. Throughout the day following a Sit and Stare session, I feel a touch lighter inside, more excited about something in the background of my doings. Seems like an enormous payout for a simple act, doesn't it? In 2014, then, I vow to do more sitting and staring, more listening and daydreaming, and will share some of the results with you here. Until next time, may your New Year be rich, your schedule sometimes empty, and your heart often full!